I feel like Michaelangelo’s Adam, my fingers a hair’s breadth away from God’s, so near and yet so far. Okay, I’m being a bit of a drama queen but it feels nothing short of tragic to be so close to the iconic symbol of an island the world has forgotten and not be able to see it or touch it or photograph it. 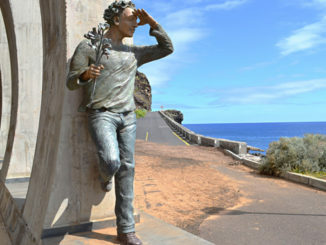 I’m standing at a junction of paths in the westernmost region of the most westerly island in the Canarian Archipelago – the point beyond which, for twelve centuries, man believed the world ended. 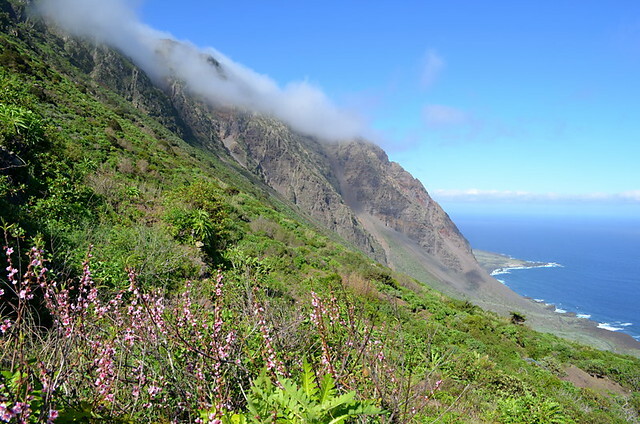 Before Columbus sailed from La Gomera on his historic 1492 voyage, the island of El Hierro was considered the most westerly point on the globe and to sail beyond its watery environs would lead to encounters with dragons ensued by a very long drop into oblivion. Known since the days of Ptolomy as the ‘end of the Ancient World’, it was through here that the Zero Meridian passed right up until the 19th century when Greenwich appropriated that title and left El Hierro to the giant lizards and oblivion. 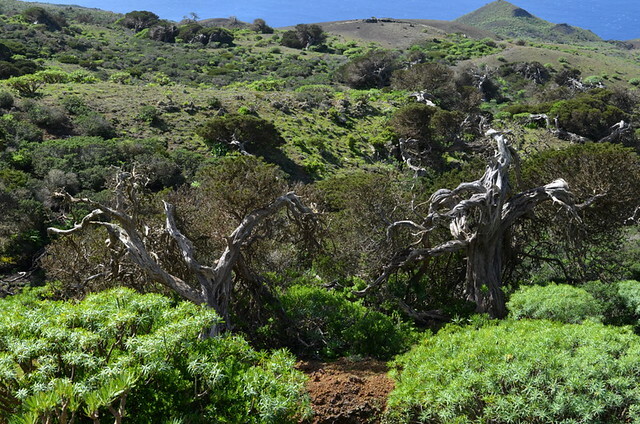 From the moment I arrived, El Hierro had charmed me with its unexpected beauty and its quiet air of mystery. 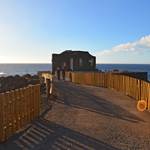 The last and smallest of the seven islands on my Canaries itinerary of discovery, it was turning out to be the most enigmatic and compelling of them all. Eschewing the tourist trap that each of the islands has fallen into in varying degrees, El Hierro has retained a dignity and nobility once inherent in all the Canary Islands and today only evident in those that have succumbed the least to the economic lure of the sun seekers, and in undiscovered pockets of the rest. 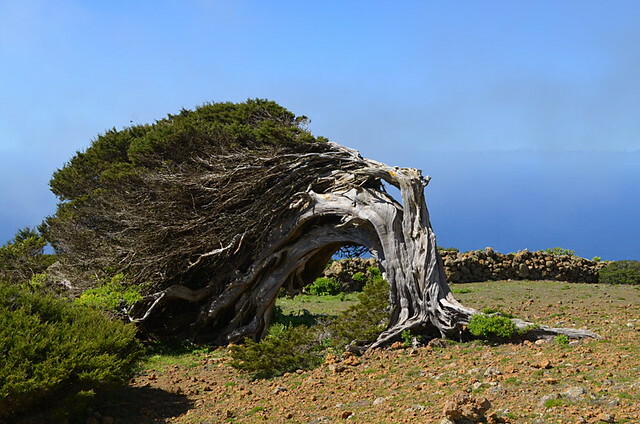 As little as I really knew about the island before I arrived on a ferry from Tenerife and disembarked in darkness to drive along unlit roads that twisted and climbed into gaping infinity, there were two images in my mind that for me, represented El Hierro. 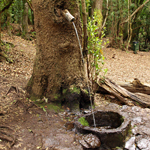 The first was a drawing of naked and hairless, primitive men filling water pots from a small lake at the base of a tree – an illustration of the sacred Garoë Tree in the excellent Insight Guide to Tenerife and the Western Canary Islands. 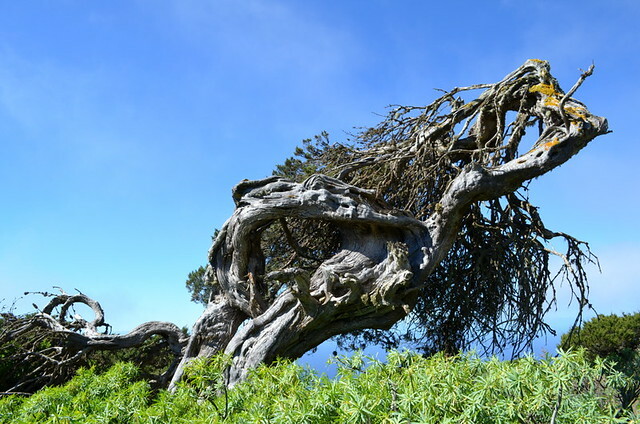 The second was a photograph of a great Sabine (Savin Juniper) tree, its limbs twisted and bent double by the prevailing winds. I can’t remember where I saw the latter image but it is as clear in my mind as the signpost before me now, pointing in the opposite direction from the one that says ‘El Sabinar’. 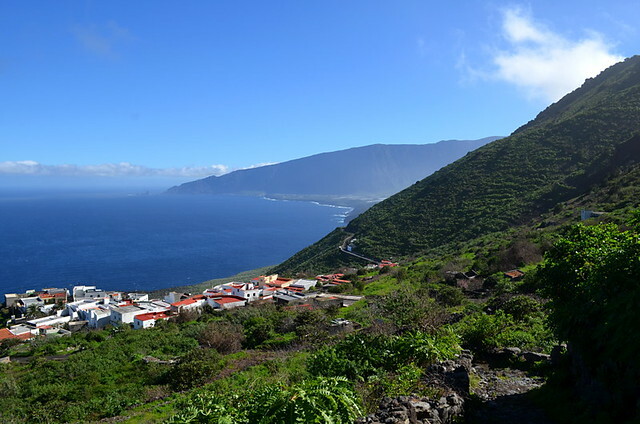 When we set off this morning, it was with the intention of driving to the Ermita of Nuestra Señora de Los Reyes at the western edge of the island’s spine, 900 or so metres above its lava strewn coastline. 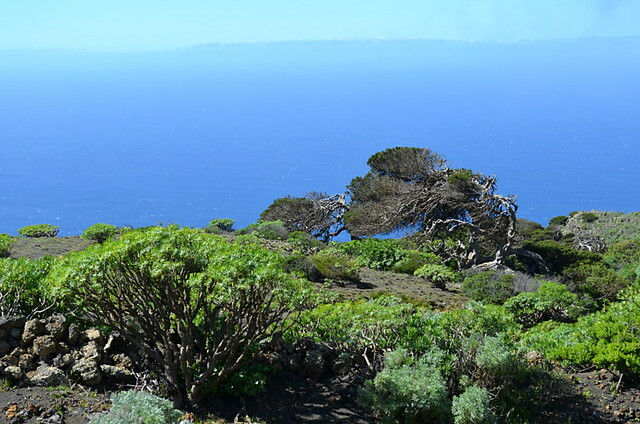 From there, a circular walk would take me and my hiking companions alongside the sabine tree and to the promise of incredible viewpoints across the infinity of the Atlantic Ocean. 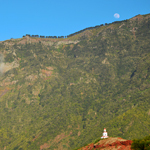 Unfortunately, recent landslides and the occasional earth tremor to which El Hierro has been almost constantly subjected over the past 18 months or so, has caused an impassable obstruction on the mountain road. Thwarted, we opt instead to leave the car in the village of Sabinosa and follow the Camino de la Dehesa which takes us up a 600 metres ascent, climbing through a layer of cloud, to emerge on the ridge. It’s tough going but the path is clear and lined with wild garlic, cistus, delicate crocus and a rainbow of wild flowers. Setting off on our circuit, we realise that our original route has now been extended by some five kilometres and two and a half hours, including the steep descent back to Sabinosa. For our companion, the inclusion of another four kilometres to see the Sabine tree is too much. Which is why I’m now standing here, in almost touching distance of that image engrained in my mind and yet, it seems, unattainable. Yesterday we didn’t have enough time to walk to the sacred site of the original Garoë Tree and after today, we won’t have enough time to come back to the Sabinar. Jack and I stand our ground. Agreement reached, we set off towards the shape on the horizon. As we walk, the wind whipping our hair around our faces, shapes begin to appear out of the mist and take solid form. At first there’s just one, perfectly arched trunk, its naked, twisted and seemingly dead branches stretching along the ground before blossoming into unexpected leafiness. Even as I walk beneath the arch and gently run my fingers along the gnarled trunk, from the corner of my eye I can see another tortured shape, and another. Leaving the path, I pick my way through the spiky euphorbias and rough gorse to take a closer look at another shape, searching through a veritable forest of prehistoric trees, another geometric on the horizon calling my name. I’m under the spell of the Sabine trees, their siren’s whispers floating on the breeze, egging me ever further into their dense limbs. Before I know it I’ve completely lost sight of my companions, and of any semblance of a path. Reluctantly, I drag myself away from the petrified and blossoming limbs and try to re-trace my steps. All around me the earth has opened into deep gullies camouflaged by dense spurges and impossible to scrabble down. Dry stone walls topped with barbed wire seem to have grown out of thin air and are barring my every direction. I have no choice but to continue scrabbling down towards the cliffs until I find a navigable way across the headland. The wind is using my hair to blindfold me and is stealing my voice as I shout to my companions to try to see which way I should be heading. Finally I see Jack waving at me from the distance and I begin to thread my way across loose boulders and crumbling stone walls towards him. All around me the wind is howling mournfully through the limbs of the Sabine trees. When I finally catch up, we’ve walked too far to turn back and have to continue on our circuit, passing the tree whose image I had seen, the iconic catalyst for this journey. We have a long way to go on tired legs but if anyone had suggested we go back and see just a few more juniper trees, I would have been first to return to the ghost forest at the end of the world. 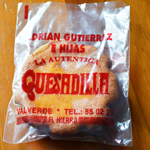 What do you mean a quesadilla isn’t a tortillas filled with cheese? Brilliant writing Andy. As you say its both creepy and beatiful up there. 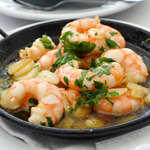 Next time you come we will take you to a place the locals fear to tread!